Get a head start on planting season next year by planting spring bulbs this month. After spending most of your time indoors for several weeks at a time, blooming bulbs will be a welcome site for your wintery weary eyes. You can plant bulbs anytime between now and when the ground freezes. Try not to wait too long though since the ground needs to be soft enough for digging. All bulbs aren’t alike, so be somewhat selective when purchasing bulbs in order to get the best results. Healthy bulbs are never dry, withered, spongy or moldy. Also, keep an eye out for relatively large bulbs since they tend to produce the most flowers. Spring flowers thrive best in specific locations, so think about your plants’ needs before committing to a certain spot. Most bulbs need a lot of light to produce blooms. Be sure to find sun/shade preferences before planting. A well-drained patch of land is ideal because soggy bulbs will rot. When considering how to arrange the locations of multiple bulbs, know that they look best in clumps or drifts. To achieve a natural effect, scatter bulbs. For a clumping effect, plant several bulbs in a large dug hole. Backfill and add bone meal to the dirt at the bottom of the hole to strenghthen roots. If you’ve ever have rodent problems in your garden, you might try adding red pepper flakes to the mix or around the soil line. An alternative solution is to place a sort of hardware mesh around the space where vulnerable bulbs have been planted. A bulb should be placed in its hole roots-first once the soil is prepared for them. Roots will emerge from the flatter side of the bulb; the stem, or pointed side should face up. Now that the bulb is planted in its proper place, give your new plant its first drink of water in its new home. Additional watering isn’t necessary unless the climate gets particularly dry. Now it’s time to sit back and give your bulb the time and space to establish itself. Your effort will be rewarded come spring, when beautiful blossoms emerge. Plant bulbs at the correct depth. As a general rule most bulbs should be planted to a depth 3 times their size. For example, a 2” bulbs should be planted 6” deep. Plant in the proper site. Bulbs need good drainage – if the soil is heavy clay improve it by adding compost, peat moss or other organic material to a depth of 12-18”. Plant the correct side up. Root remnants should identify the bottom of the bulb. Generally the pointier end will be the top. If you cannot determine from either end it is better to plant it sideways rather than chance planting it upside down. Use proper fertilizer when planting. Add a bulb fertilizer or compost to the bottom of the planting area & mix it well into the soil before planting the bulbs. Water bulbs in well. Make sure to water well after planting to settle the soil around the bulbs. 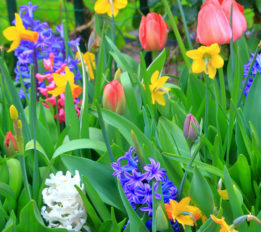 Do not plant in soggy ground as bulbs can rot if constantly wet. Consider critters. If chipmunks, rabbits, mice, deer, squirrels, etc are going after your bulbs, try planting Daffodils & Hyacinths which are much less attractive as a food source and naturalize well. If burrowing animals such as moles or voles are a problem, plant the bulbs in wire mesh baskets to protect them. General care during & after blooming. Fertilize monthly until blooms begin to fade with either a bulb fertilizer or organic 10-10-10 formula. Suppliment rainfall, if necessary, to ensure 1” of water weekly. Leave foliage to die back naturally as this feeds the bulb and strengthens it. To avoid the eyesore of yellowing leaves plant annuals in front of & between the bulbs to disguise them or plant the bulbs behind perennials that will grow up to mask them. Remove leaves only as they turn brown.